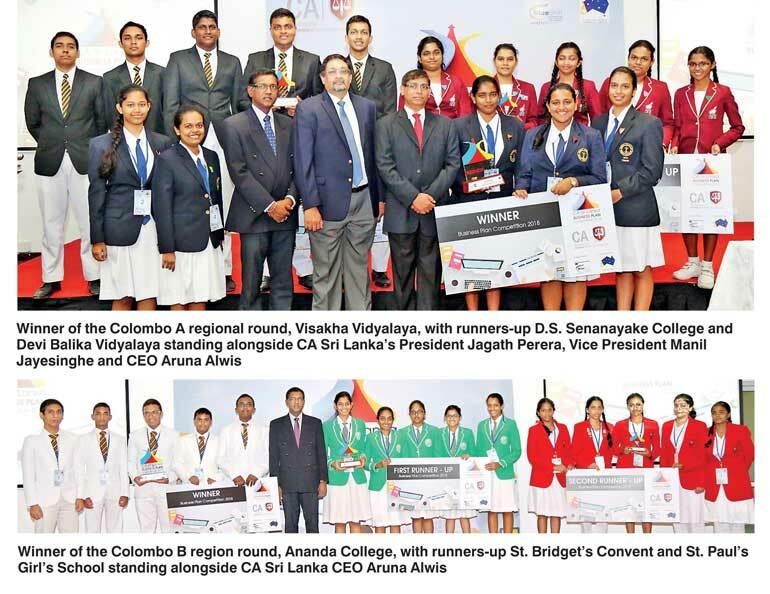 Visakha Vidyalaya, Ananda College and St. Benedict’s College beat leading schools in the Colombo District to win the Colombo A, B and C regional rounds at the 2018 Business Plan competition organised by the Institute of Chartered Accountants of Sri Lanka (CA Sri Lanka). A total of 15 schools took part in the three regional rounds of the Colombo District which were held in February at the institute premises. In the Colombo A regional round, D.S. Senanayake College, Nalanda College, Musaeus College, Visakha Vidyalaya and Devi Balika Vidyalaya competed against each other with Visakha Vidyalaya winning the round, while D.S. Senanayake College was adjudged the first runner-up and Devi Balika Vidyalaya emerged as the second runner-up. In the Colombo B region round, Ananda College beat St. Bridget’s Convent, Lyceum International, Nugegoda, St. Paul’s Girls School, Milagiriya and Zahira College to win the Colombo B regional round. St. Bridget’s Convent was adjudged the first runner-up, while St. Paul’s Girl’s School came in as the second runner-up. In the Colombo C round, St. Benedict’s College, Ladies’ College, Sirimavo Bandaranaike Vidyalaya, Bishop’s College and St. Sebastian’s College competed against each other, with St. Benedict’s College winning, while St. Sebastian’s College, Moratuwa was adjudged the first runner-up and Ladies’ College finished as the second runner-up. Visakha Vidyalaya, Ananda College and St. Benedict’s College qualified for the Business Plan competition grand finale with the winning team flying to Brisbane, Australia to take part in the Blue Shift Case competition organised by the QUT Business School of the Queensland University of Technology. The competition, which was organised for the third time, offers a vital platform as it helps encourage GCE Advanced Level students from the commerce stream to gain a better understanding of the importance of developing a business plan and thereby helping harness entrepreneurial skills among future business leaders in the country. This year some 50 schools from across the country, including from the Gampaha, Galle, Kurunegala, Kandy and Jaffna districts, are competing at the regional levels to qualify for the grand finale, which will bring together the winners of each regional round. The strategic partner of this year’s competition is the QUT Business School of the Queensland University of Technology, Brisbane, while the competition is organised in association with the Sri Lanka and Australia Chamber of Commerce (SLACC).